Historically, doctors often made house calls – dropping by for a visit to check up on an ill family member was not only commonplace but also very convenient. Health care today is delivered much differently – for better or for worse, visits to a clinic or hospital ER are predominantly the only way to be seen by a health care professional. At HomeMD, we realize health care is not one size fits all. Some patients may have difficulty attending the office due to illness, mobility issues or even child care. Historically, doctors often made house calls – dropping by for a visit to check up on an ill family member was not only commonplace but also very convenient. Health care today is delivered much differently – for better or for worse, visits to a clinic or hospital ER are predominantly the only way to be seen by a health care professional. At HomeMD, we realize health care is not one size fits all. Some patients may have difficulty attending the office due to illness, mobility issues or even child care. We have created a simple app that is a remedy for these issues – download our app today and receive unlimited family medical home visits from a health care professional. Our expert nurse practitioners come right to your home to assess, diagnose and treat most of your health conditions and concerns. Our team is prompt, qualified and professional, taking a careful history and listening to your issues patiently and without rushing. HomeMD is proud of this contribution to patient-centered care and we will strive to ensure all of your needs are met. Our futuristic app is visionary and offers three ways to receive care in an unlimited way – telemedicine or video calling, a state of the art walk-in clinic in mid-town Toronto, as well as an unlimited number of home visits to help you through any medical concern that cannot be solved with the alternative platforms. Regardless of the make-up of your family, it is important to have family health solutions for each member. Whether you are looking for care for a newborn, a senior or anything in between, or have a chronic problem or an acute one, HomeMD’s app can greatly assist you in accessing care and can be a key to the best family health solutions for you. With our app, not only do you receive the very convenient and quick option of telemedicine and the option of a medical walk-in clinic, you also have the option of unlimited home visits. Receive professional care by qualified nurse practitioners, one of the most dedicated, caring groups of health care professionals. Our NPs are authorized to do nearly any task a family doctor can, including assess, prescribe, diagnose, order lab tests and perform some procedures. All of this is done with care, compassion and a personal touch that can often be missing in our current health care system. Open the door to our health care professionals and you will wonder why you ever sat in a medical waiting room or emergency room – our team will work patiently and efficiently to assess your concerns and offer solutions to your health care issue. From the time we knock on your door through to diagnosis and treatment, the patient is our priority. HomeMD offers unlimited family health solutions in the comfort of your home for an affordable monthly subscription fee. HomeMD| Home Health Care | Video Conferencing or Home Visit – You Choose! Why Consult WebMD Ever Again? If telemedicine is the future of health care, home health care has a central role to play as well. Sometimes face to face is the only way to solve a problem and when a client can’t make the trip to our clinic or video conferencing is not appropriate due to the nature of the illness, we will come to you. Video-conferencing is a great way to solve everyday concerns, but a special trip may be needed for more acute problems or even chronic problems. 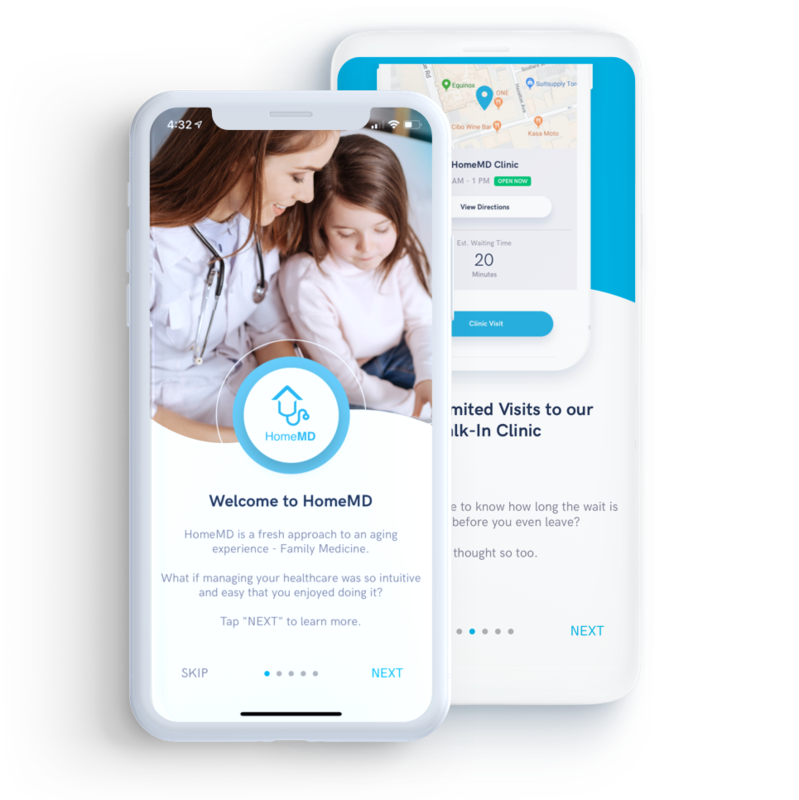 With our forward-thinking app, HomeMD has made it possible to stop searching the internet for cures and diagnoses – we are a WebMD alternative that offers home health care in an unlimited way to all of our subscribers. Our health care professionals will treat you with evidenced-based medicine vs. searching the internet and perhaps getting misinformation, causing additional worry and fear. Nurse practitioners are shown to improve timely access to high-quality, cost-effective care. HomeMD helps take the fear out of health concerns by delivering quality, evidenced-based, personalized medicine right to your front door. Welcome to the future of family medicine in Canada. Now serving the mid-town Toronto area, HomeMD features a powerful new app offering a unique platform designed to make your life easier and healthier. In addition to telehealth and a state of the art clinic located in mid-town Toronto, we offer unlimited monthly family medical home visits to your family. Personalized, professional and caring nurse practitioners come to your home to diagnose and treat your medical needs.For only $50 plus HST per month our app will provide you with the following:– Secure digital access to all your medical records;– Unlimited home visits by our medical professionals;– Unlimited visits to our state of the art medical clinic conveniently located in mid-town Toronto;– Unlimited Video Consultations with our Medical Professionals. HomeMD | Attentive, Comprehensive Medical Care – All in your Back Pocket!